Video game consoles have become more than just video gaming machines in recent years. Now, several cable company’s want in on the action–and they don’t just want to bring you video games into the living room–but rather provide you with an all-encompasing video-entertainment system like you have never seen before. According to a report from Bloomberg, three cable companies—Verizon, AT&T, and Time Warner Cable are all looking to make moves to add video games as a key component of their cable services in the future. By doing so they are effectively cutting out console makers completely, and want to create they own services on their own platforms. 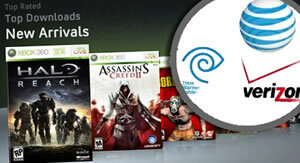 Products are believed to be on track for early testing and debut beginning in 2013, and the proposed services would be similar to that of the now defunct OnLive streaming-game product. Analysts believe that for such an idea to be successful the cable companies will have to stream Triple A titles, and one group is believed to be in talks with Electronic Arts for securing a game-streaming partnership. The report could weight heavy for the industry, and especially for current console makers like Sony and Nintendo. Microsoft is already in talks with Comcast Cable to possibly partner with them to provide the upcoming Xbox 720 as a subsidized cable box. Comcast already provides an on-demand video streaming service, and adding a game functionality to their packages is where they for-see themselves going in the future. Users can already use video-streaming services like Hulu and Netflix through today’s current video-gaming consoles. Thus the major cable companies will have an upwards battle if they are going to try and replace what consumers already know and love for something they already don’t want to pay for–that expensive cable bill. Are Cable Companies Trying To Stifle Online TV Services? Cable companies offering internet TV for free!